Tailgating (following too closely behind another vehicle) is illegal and a dangerous driving behavior. Tailgating increases the risk of rear-end collisions, which account for over 30% of all traffic accidents. Serious personal injury and property damage can result from this risky driving habit. Tailgating is defined as the practice of driving too close to another vehicle, at a distance which does not guarantee that stopping to avoid a collision is possible. Following too close accidents typically occur in urban areas where stop lights, stop signs, and pedestrian traffic all can lead to a driver stopping suddenly. Tailgating is often associated with aggressive driving and road rage. 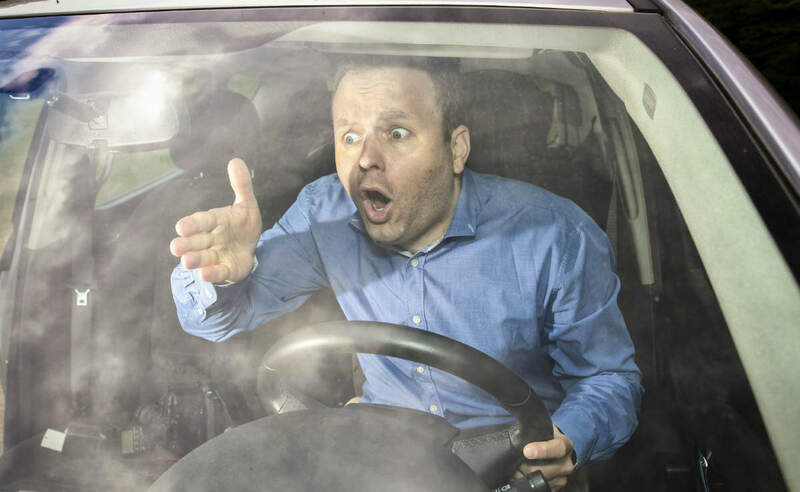 Impatience over being stuck behind a slower driver can cause a driver to act aggressively. Some drivers are in a hurry because of running late and are tempted to speed. In addition to tailgating, an aggressive driver may blow their horn and flash their lights. Protect yourself from injury by letting an aggressive driver pass you. Simply pull over if it is legal and safe to do so. Do not retaliate by abruptly slowing down. However, not all drivers who follow too closely are trying to intimidate you. The driver may not be aware they are too close because of not paying attention. More experienced drivers at times overestimate their skill and become complacent about allowing sufficient distance to avoid an accident. Choose an object near the road ahead, like sign or telephone pole. As the vehicle ahead of you passes it, count slowly, “One thousand one, one thousand two, one thousand three.” If you reach the object before you finish counting, you are too close to the vehicle ahead. You may feel insulted or annoyed by a driver who is tailgating you. However, it is important to remain calm and to not react with emotion. Instead, use your head and allow the driver to pass you. If the driver is not aware they are too close, then consider changing lanes to put some distance between the two of you. Remember, you always have the option to simply ignore the too close driver, especially if they do not show they have the intention of passing you. Be a considerate driver yourself by following the posted speed limits, drive in the right lane, and pass in the left lane. If you have been rear-ended by a careless driver, proving that the driver was guilty of tailgating can be tricky without eyewitness testimony. Evidence will be needed to prove the driver was following too close – vehicle damage, skid marks, and the extent of any injuries. Our team of car accident experts from The Hoffmann Law Firm, L.L.C. will help you build a strong case so you can recover compensation for damages. Call us at (314) 361-4242 for a free consultation with a St. Louis car wreck lawyer.